Apple Aperture is a photo editing and management program that developed for Mac OS X.The software handles a number of tasks common in post-production work such as importing and organizing image files, applying corrective adjustments, displaying slideshows, and printing photographs. Features of Apple Aperture include non-destructive editing, organization of photographs by keyword, faces, and places, brushes for applying effects, and exporting to several popular websites, including Facebook, SmugMug, Flickr and Apple's defunct MobileMe service. On January 6, 2011, Apple announced its availability on the Mac App Store. Aperture 3.4, the latest version of the software, was released on September 19, 2012 and runs on Intel-based Mac computers. Aperture claims to have AVCHD support such as importing, viewing and trimming AVCHD video captured on many popular cameras, but users still have failure issues while trying to import AVCHD footage into it. So you might consider using a program like Pavtube MTS/M2TS Converter for Mac (also known as an AVCHD to Aperture Converter) to convert AVCHD MTS to Apple ProRes 422 before loading to Aperture. Here is a step-by-step instruction. How to convert AVCHD footage to Aperture editable file format? 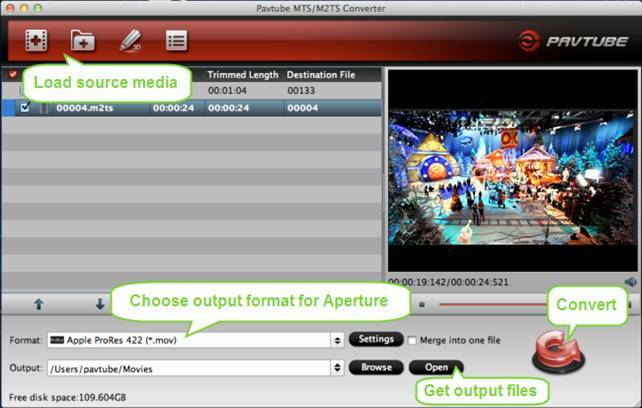 Run Pavtube MTS Converter for Mac as the best MTS to Apple Aperture Video Converter. Click “Add video” or “Add from folder” button to load your source media files directly from your camera or from the file folder that contains the source AVCHD mts clips stored on your computer’s hard disk drive. Move your cursor to “Format” menu and choose “Apple ProRes 422 (*.mov)” as output format for Aperture from “Final Cut Pro” column. Click “Convert” button and the program will start converting AVCHD MTS to QuickTime for Aperture immediately. Once the conversion task finished, you can click “Open” button to get the generated MOV files and import to Aperture for editing. How to import the converted AVCHD files to Aperture? 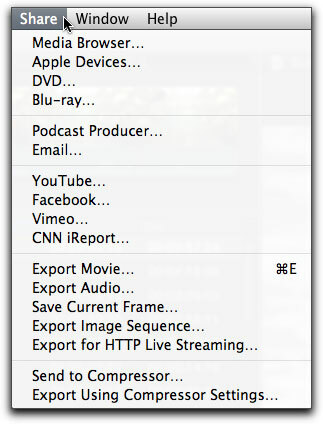 Launch Apple Aperture, choose File > Import > Files…, and browse to where you save the converted videos to. Choose the videos that you’d like to import. If you need to burn QuickTime movies that exported from FCP X to a blank DVD on Mac, the following guide is worthy reading. Before starting up Pavtube Free DVD Creator for Mac, you should export Final Cut Pro X project to QuickTime MOV files in advance. When finished editing in Final Cut Pro X, export directly from FCP X under ‘Share > Export Movie…’ and use the codec of ‘Current Settings’. Start up Free Pavtube DVD Creator for Mac, click “Import” tab to browse your hard drive and load the FCP X exported MOV files into the program. Or you can just drag & drop the MOV files into it for burning. To create another Title, click the "Add Title" button and add more source videos. Please notice the size indicator at the bottom, if it exceeds the red line, you are suggested change to DVD9 or remove some videos. Free Pavtube DVD Creator for Mac enables you to custom a DVD menu to fully access your Final Cut Pro X QuickTime videos on DVD disc. There are three built-in DVD menu templates under “Menu” tab for you to choose from. If you don’t want a menu, you can choose no menu. After selecting a menu template, you can change menu buttons, thumbnails, add text, background music and background images to author a personalized DVD menu. Switch to “Preview” tab to have a look at the final playback effect of your DVD. If anything needs to be changed, go back to the former steps to do modification. Once you are satisfied, go to “Burn” tab to set settings like video standard (PAL or NTSC), audio channels (5.1 channels, Mono, Stereo), output settings, disc label, and DVD drive (please insert a blank DVD disc into your selected DVD writer). Press “Burn” button and the Free Mac DVD authoring program will start creating DVD from FCP X MOV source files automatically.